Last year we undertook the ‘Many Voices, One AnglicareSA’ employee survey. The anonymous survey gave our staff the opportunity to have their say about what they like about working at AnglicareSA, how they think their leaders and managers are tracking, and where they think the organisation needs to improve. 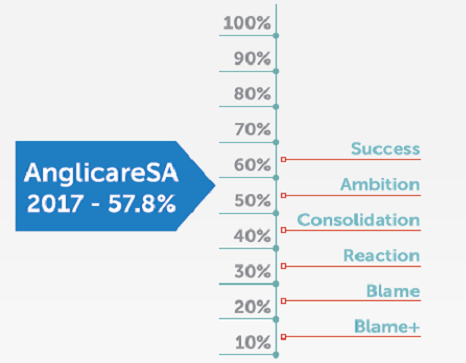 The questionnaire provided us with a host of fascinating findings, many of which will help to shape AnglicareSA’s future direction. But for now, here are some key takeaways from the organisation wide survey that we reckon are absolutely precious. 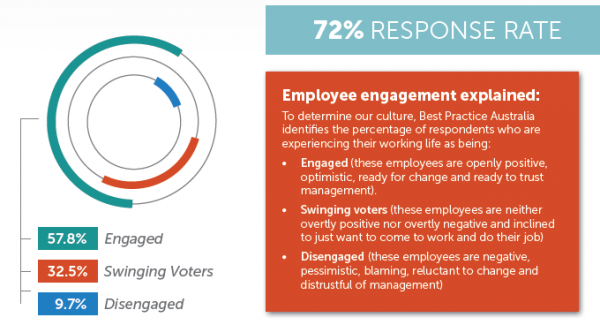 A total of 72% of our 1,800 employees took part in this survey; and as you can see more than 57% of respondents are engaged with the organisation. With an employee engagement score of 58% we’ve maintained our position from our last survey (conducted in 2015) as a ‘culture of ambition’. A culture of ambition is characterised by: 50 -60% of employees actively engaging with the organisation. Almost three out of four Anglicarers agreed with the bold statement: “AnglicareSA is a truly great place work”. The Net Promoter Score (NPS) provides organisations with a gauge of employee loyalty and engagement. Promoters are extremely likely to recommend an organisation, whereas detractors are not at all likely to recommend it. The NPS is the percentage of promoters minus the percentage of detractors. For organisations like AnglicareSA, a NPS of above 40 is best practice. And as you can see, we’re almost there. As a culture of ambition our staff are committed to our goals and values. This gives us great heart and means that Anglicarers are for the most part committed to the organisation. The survey provided us with a lot of rich data and allows us to better understand where we need to make improvements. However, much like our staff we’re optimistic for the future, and I’m sure that with a little more work we can strive towards a ‘culture of success’. Kurt Tippett will be sharing some of his footy skills and offering up some tips on the environment at a special football clinic on Friday August 26. As ResourceCo’s Sustainability Ambassador, he’s joining forces with AnglicareSA to give some children a few tips about the game and about the environment. ResourceCo is South Australia’s leading resource recovery and recycling business. AnglicareSA is the largest non-government welfare organisation in South Australia. Together they are providing a coaching clinic for some children who have been identified through Anglicare’s Aboriginal programs and children’s services. Tippett is ResourceCo’s Sustainability Ambassador and that means one of his roles is to teach the messages of sustainability and looking after the environment. “I’m a big believer in doing the right thing by the environment. We have a duty to show the next generation the right way to look after themselves through good health and fitness and the environment through recycling wherever possible and reducing our emissions,” said Tippett. The clinic is being held on Friday August 26 at Henley & Grange Memorial Oval, Atkin Street Henley Beach from 4pm. To view a snapshot from the day, view the video here. Further information please contact Lesley Johns (ResourceCo) 0412 583 577, Jenny Barrett 0408 717 025 (Anglicare).